The barrier route as of July 2006. Some previously approved portions have become uncertain due to Israeli Supreme Court decisions and are subject to re-design. , the length of the barrier approved by the Israeli government was 703 kilometers (436 miles). By April 2006, approximately 58.4% of the barrier had been constructed, 8.96% was under construction, and construction had not yet begun on 33% of the barrier. The Israeli West Bank barrier is a barrier being constructed by the State of Israel. It consists of a network of fences with vehicle-barrier trenches surrounded by an on average 60 meter wide exclusion area (90%) and high concrete walls up to 8 meters high (10%). The barrier is built mainly in the West Bank and partly along the 1949 Armistice line, or "Green Line" between Israel and Palestinian West Bank. In April 2006, the length of the barrier approved by the Israeli government was 703 kilometers (436 miles). In August 2008, approximately 58.04% had been constructed, 8.96% was under construction, and construction had not yet begun on 33% of the barrier. The Jerusalem Post reported in July 2007 that the barrier may not be completed until 2010, seven years after it was originally supposed to be finished. The barrier is highly controversial. Supporters argue that the barrier is necessary to protect Israeli civilians from Palestinian terrorism, including the suicide bombing attacks that increased significantly during the Al-Aqsa Intifada; The significantly reduced number of incidents of suicide bombings from 2002 to 2005 has been partly attributed to the barrier. Opponents of the barrier object that the route substantially deviates from the Green Line into the occupied territories captured by Israel in the Six-Day War of 1967. They argue that the barrier is an illegal attempt to annex Palestinian land under the guise of security, violates international law, has the intent or effect to pre-empt final status negotiations, and severely restricts Palestinians who live nearby, particularly their ability to travel freely within the West Bank and to access work in Israel. In a 2004 advisory opinion, the International Court of Justice declared that "Israel cannot rely on a right of self‑defence or on a state of necessity in order to preclude the wrongfulness of the construction of the wall. Construction of the barrier is contrary to international law." Settler opponents, by contrast, condemn the barrier for appearing to renounce the Jewish claim to the whole of the Land of Israel. Two similar barriers, the Israeli Gaza Strip barrier and the Israeli-built 7-9 meter (23 – 30 ft) wall separating Gaza from Egypt (temporarily breached on January 23, 2008), have been much less controversial. The naming of the barrier is controversial. Israelis most commonly refer to the barrier as the "separation (hafrada) fence" ( גדר ההפרדה (help·info), Geder HaHafrada) and "security fence" or "anti-terrorist fence", with "seam zone" (קו התפר, Kav HaTefer) referring to the land between the fence and the 1949 armistice lines. Palestinians most commonly refer to the barrier in Arabic as "jidar al-fasl al-'unsuri" (help·info), (racial segregation wall), and some opponents of the barrier refer to it in English as the "Apartheid Wall." The International Court of Justice, in its advisory opinion on the barrier, wrote it had chosen to use the term "wall" "the other expressions sometimes employed are no more accurate if understood in the physical sense." The BBC's style guide for journalists states "The BBC uses the terms barrier, separation barrier or West Bank barrier as acceptable generic descriptions to avoid the political connotations of "security fence" (preferred by the Israeli government) or "apartheid wall" (preferred by the Palestinians)." View of fortified slabs of concrete which stand as a mile-long barrier, following the border between Bat Hefer and Tulkarm, taken during Second Intifada in 2001. This was the first concrete wall section of the barrier constructed (during the Oslo Accords negotiations in 1994). The idea of creating a physical barrier between the Israeli and Palestinian populations was first proposed by in 1992 by then-prime minister Yitzhak Rabin, following the murder of an Israeli teenage girl in Jerusalem. Rabin said that Israel must "take Gaza out of Tel Aviv", in order to minimize friction between the peoples. Following an outbreak of violent incidents in Gaza in October 1994, Rabin announced his stance that "we have to decide on separation as a philosophy. There has to be a clear border. Without demarcating the lines, whoever wants to swallow 1.8 million Arabs will just bring greater support for Hamas." In early 1995, the Shahal commission was established by Yitzhak Rabin to discuss how to implement a barrier separating Israelis and Palestinians. Israeli Prime Minister Ehud Barak, prior to the Camp David 2000 Summit with Yasser Arafat, vowed to build a separation barrier, stating that it is "essential to the Palestinian nation in order to foster its national identity and independence without being dependent on the State of Israel". In June 2001, a grass roots organization called "Fence for Life - The Public Movement for The Security Fence" began the grassroots effort for the construction of a continuous security fence. The movement was founded by people from all over Israel following the Dolphinarium discotheque suicide bombing. The stated goal of the movement is to encourage the government to construct a security fence along Israel's borders. "Fence for Life" urged the government to build a contiguous fence as speedily as possible, and without any connection to the political future of the areas it separates, with a goal of hermetically sealing off the Palestinian territories from Israeli population centers to prevent the terrorist acts by Palestinians against the people living in Israel. The "Fence for Life" campaign emphasized that any security fence has no connection whatsoever to the political future of the settlements. The Movement for the Security Fence for Israel included protests, demonstrations, conferences with public figures, media blitzes, lobbying in the Knesset as well as legal battles in the High Court of Justice, both with demands to quickly build the security fence as well as appeals not to cause further delay in construction. The movement does not support any specific path for the barrier, as this is subject to a government decision. "Fence for Life" was of the opinion that "politicization" of the fence by various groups was delaying the completion of the security barrier and is likely to block its construction. At the end of 2002, due to government inaction, several localities who suffered the most from lack of a border barrier had started to build the barrier using their own funds directly on the green-line. Although the government of Prime Minister Ariel Sharon was initially hesitant to construct the barrier, he finally embraced the plan. The stated purpose of the barrier is to prevent terrorists from entering Israeli cities, a problem which has plagued Israel since the start of the Second Intifada. A secondary stated purpose of the barrier is to prevent infiltration by Palestinians for economic reasons. The Israeli government says that the high concrete portions are to protect cars and people on the Israeli side from gunfire. When Israel's free society was defending itself against an unprecedented campaign of terror, most of the international community was calling for an end of the "cycle of violence" and a return to the negotiating table. When the Palestinian terrorists struck... Israel was condemned for imposing "collective punishment" on the Palestinian population. When Israel chose to target individual terrorists with precision air strikes, its actions were condemned as illegal extrajudicial assassinations. It seemed that in eyes of many, the Jews had a right to defend themselves in theory but could not exercise that right in practice... our government understood that there were three options to maintain an acceptable level of security for our citizens. The first was to wage a total war against Palestinian terror using weapons that would claim many innocent Palestinian lives. The second was to keep our reserves constantly mobilized to defend the country. The third option was to build the security fence. Had the Palestinian Authority become a partner in fighting terror, as it was obliged to do under all the agreements that it signed, none of these options would have become necessary. The barrier generally runs along or near the 1949 Jordanian-Israeli armistice/Green Line, but diverges in many places to include on the Israeli side several of the highly populated areas of Israeli settlements in the West Bank such as East Jerusalem, Ariel, Gush Etzion, Emmanuel, Karnei Shomron, Givat Ze'ev, Oranit, and Maale Adumim. Most of the barrier is actually set in the West Bank. It diverges from the "Green Line" by anywhere from 200 meters to as much as 20 kilometers, with the result that many Israeli settlements in the West Bank remain on the Israeli side of the barrier, and some Palestinian towns are nearly encircled by it. Approximately 20% is actually on the Green Line. The proponents of the barrier claim that its route is not set in stone, as it was challenged in court and changed several times. They note that the cease-fire line of 1949 was negotiated "without prejudice to future territorial settlements or boundary lines" (Art. VI.9). Security experts argue that the topography does not permit putting the barrier along the Green Line in some places, because hills or tall buildings on the Palestinian side would make the barrier ineffective against terrorism. The International Court of Justice has countered that in such cases it is only legal to build the barrier inside Israel. Israeli West Bank barrier - North of Meitar, near the southwest corner of the West Bank. As of November 2003, the barrier extends inside most of the northwestern and western edges of the West Bank, sometimes close to the Green Line, and sometimes running further east. In some places there are also secondary barriers, creating a number of completely enclosed enclaves. In February 2004, the Israeli government said it would review the route of the barrier in response to US and Palestinian concerns. In particular, Israeli cabinet members said modifications would be made to reduce the number of checkpoints Palestinians had to cross, and especially to reduce Palestinian hardship in areas such as Qalqilyah where the barrier goes very near, and in some cases nearly encircles, populated areas. On June 30, 2004, the Supreme Court of Israel ruled that a portion of the barrier west of Jerusalem violates the rights of Palestinians, and ordered 30 km of existing and planned barrier to be rerouted. However, it did rule that the barrier is legal in essence and accepted the Israeli government's claim that it is a security measure. On July 9, 2004, the International Court of Justice issued an advisory opinion that it is a violation of international law. At the beginning of September 2004, Israel started the southern part of the barrier. On February 20, 2005, the Israeli cabinet approved a new route. The new route was 681 kilometers and would leave approximately seven percent of the West Bank and 10,000 Palestinians on the Israeli side. (Map) Before that time, the exact route of the barrier had not been finalized, and it had been alleged by opponents that the barrier route would encircle the Samarian highlands of the West Bank, separating them from the Jordan valley. Following a suicide bombing in Tel Aviv, the route was again revised by a cabinet decision on April 30, 2006. In the Ariel area, the new route corrects an anomaly of the previous route that would have left thousands of Palestinians on the Israeli side. The Alfei Menashe settlement bloc was reduced in size, and the new plan leaves three groups of Palestinian houses on the Palestinian side of the fence. The barrier's route in the Jerusalem area will leave Beit Iksa on the Palestinian side; and Jaba on the Israeli side, but with a crossing to the Palestinian side at Tzurif. Further changes were made to the route around Eshkolot and Metzadot Yehuda, and the route from Metzadot to Har Choled was approved. According to the current route, 8.5 percent of the West Bank territory and 27,520 Palestinians are on the "Israeli" side of the barrier. Another 3.4 percent of the area (with 247,800 inhabitants) is completely or partially surrounded by the barrier. See also 1949 Cease-fire line vs. the permanent border. Most of the barrier (over 95% of total length) consists of a "multi-layered fence system" ideally 50 m in width. The IDF's preferred design has three fences, with pyramid-shaped stacks of barbed wire for the two outer fences and a lighter-weight fence with intrusion detection equipment in the middle. Patrol roads are provided on both sides of the middle fence, an anti-vehicle ditch is located on the West Bank side of the fence, and a smooth dirt strip on the Israeli side for "intrusion tracking". Some sections (less than 5% of total length) are constructed as a wall made up of concrete slabs up to 8 m in height and 3 m in width. Occasionally, due to topographic conditions other sections of the barrier will reach up to 100 m in width. Wall construction (5%) is more common in urban settings, such as areas near Qalqilyah and Jerusalem, because it is narrower, requires less land, and provides more protection against snipers. In all cases there are regular observation posts, automated sensing devices and other apparatuses. Gates at various points are controlled by Israeli soldiers. Israeli statistics indicate that the barrier has substantially reduced the number of Palestinian infiltrations and suicide bombings and other attacks on civilians in Israel and in Israeli settlements, and Israeli officials assert that completion of the barrier will make it even more effective in stopping these attacks since "An absolute halt in terrorist activities has been noticed in the West Bank areas where the fence has been constructed". Israel's state comptroller, however, notes that most of the suicide bombers crossed into Israel through existing checkpoints. Israeli officers (including the head of the Shin Bet) quoted in the newspaper Maariv have said that in the areas where the barrier was complete, the number of hostile infiltrations has decreased to almost zero. Maariv also stated that Palestinian militants, including a senior member of Islamic Jihad, had confirmed that the barrier made it much harder to conduct attacks inside Israel. Since the completion of the fence in the area of Tulkarm and Qalqilyah in June 2003, there have been no successful attacks from those areas. All attacks were intercepted or the suicide bombers detonated prematurely. In a March 23, 2008 interview, Palestinian Islamic Jihad leader Ramadan Abdallah Shalah complained to the Qatari newspaper Al-Sharq that the separation barrier "limits the ability of the resistance to arrive deep within [Israeli territory] to carry out suicide bombing attacks, but the resistance has not surrendered or become helpless, and is looking for other ways to cope with the requirements of every stage" of the intifada. There is general agreement that the barrier improved Israeli security with regard to suicide bombings. However, there is debate over how effective the barrier has been in preventing other attacks. A report by the Shin Beit, published in early 2006 notes that attacks in 2005 have significantly decreased due to increased pursuing of Palestinian militants by the Israeli army and intelligence organizations, Hamas's increased political activity, and a truce among Palestinian militant groups in the Palestinian Territories. According to Haaretz the report also mentions that "The security fence is no longer mentioned as the major factor in preventing suicide bombings, mainly because the terrorists have found ways to bypass it." Former Israeli Secretary of Defence Moshe Arens claims that the reduction in Palestinian violence is largely due to the IDF's entry into the West Bank in 2002. According to a 2005 report published by the Jerusalem Institute for Israel Studies, the barrier being built around Jerusalem may have unintended effects on the city. According to the study, many Jerusalem Palestinians who were living in areas outside the barrier are now moving back into the city, creating housing shortages, increased real estate prices, and the phenomena of Palestinians moving into traditionally Jewish neighborhoods of the city. Arguments from right wing Israeli circles that the fence will reduce the Jewish population behind it have been countered from the same circles, arguing that attempts to keep Jews out of the land they believe is theirs are no more likely to succeed today than they were in Mandate Palestine, when the British blockaded the shores and issued the White Paper of 1939 to prevent Jews from purchasing land in the Mandate. The barrier has many effects on Palestinians including reduced freedoms, reduction of the amount of Israel Defense Forces checkpoints, road closures, loss of land, increased difficulty in accessing medical services in Israel, restricted access to water sources, and economic effects. An often-quoted example of the effects of the barrier is the Palestinian town of Qalqilyah, a city of around 45,000, which is surrounded on all sides by the barrier. One 8 meter-high concrete section of this wall follows the Green Line between the city and the nearby Trans-Israel Highway. This section, referred to as an "anti-sniper wall," has been claimed to prevent gun attacks against Israeli motorists on the Trans-Israel Highway. The city is accessible through a military checkpoint on the main road from the east, and an underground tunnel built in September 2004 on the south side connects Qalqilyah with the adjacent village of Habla. Recently, the Israeli Supreme Court ordered the government to change the route of the barrier in this area to ease movement of Palestinians between Qalqilyah and five surrounding villages. In the same ruling, the court rejected the arguments that the fence must be built only on the Green Line. The ruling cited the topography of the terrain, security considerations, and sections 43 and 52 of The Hague Regulations 1907 and Article 53 of the Fourth Geneva Convention as reasons for this rejection. In early October 2003, the IDF OC Central Command declared the area between the separation barrier in the northern section of the West Bank (Stage 1) and the Green Line a closed military area for an indefinite period of time. New directives stated that every Palestinian over the age of twelve living in the enclaves created in the closed area have to obtain a “permanent resident permit” from the Civil Administration to enable them to continue to live in their homes. Other residents of the West Bank have to obtain special permits to enter the area. Parts of the barrier are built on land seized from Palestinians. In a recent report, the UN noted that the most recent barrier route allocates more segments to be built on the Green Line itself compared to previous draft routes of the barrier. However, in its current route the Wall is annexing 9.5% of the total area of the West Bank to the Israeli side of the barrier. According to the United Nations Relief and Works Agency (UNRWA), 15 communities were to be directly affected, numbering approximately 138,593 Palestinians, including 13,450 refugee families, or 67,250 individuals. In addition to loss of land, in the city of Qalqilyah one-third of the city's water wells lie on the other side of the barrier. The Israeli Supreme Court notes the Israeli government's rejection of accusations of a de facto annexation of these wells, stating that "the construction of the fence does not affect the implementation of the water agreements determined in the (interim) agreement". Médecins du Monde, the Palestinian Red Crescent Society and Physicians for Human Rights-Israel have stated that the barrier "harms West Bank health". Upon completion of the construction, the organizations predict, the barrier would prevent over 130,000 Palestinian children from being immunised, and deny more than 100,000 pregnant women (out of which 17,640 are high risk pregnancies) access to healthcare in Israel. In addition, almost a third of West Bank villages will suffer from lack of access to healthcare. After completion, many residents may lose complete access to emergency care at night. In towns near Jerusalem (Abu Dis and al-Eizariya), for example, average time for an ambulance to travel to the nearest hospital has increased from 10 minutes to over 110 minutes. A report from Physicians for Human Rights-Israel states that the barrier imposes "almost-total separation" on the hospitals from the population they are supposed to serve. The report also noted that patients from the West Bank visiting Jerusalem's Palestinian clinics declined by half from 2002 to 2003. Members of al-Aqsa Martyrs' Brigades, Hamas, and the Palestinian Islamic Jihad have been less able to conduct attacks in Israel, the numbers of which have decreased in areas where the barrier has been completed. Daniel Ayalon, Israel's ambassador to the United States, suggested that reduced ability to conduct attacks would "save the political process" because the barrier would neutralize the ability of militant groups "to hold that process hostage" by conducting these acts. In his November 2006 interview with Al-Manar TV, Palestinian Islamic Jihad leader Ramadan Salah said that the barrier is an important obstacle, and that "if it weren’t there, the situation would be entirely different." Figure 1: Real Annual GDP Growth, West Bank. Source: CIA World Factbook, World Bank. Real GDP growth in the West Bank increased modestly in 2003, 2004, and 2005 after declining in 2000, 2001, and 2002 (see Figure 1). However, these drops in economic productivity came before the construction of the barrier began. In 2005, the PNA Ministry of Finance cited the 2003 "construction of the separation wall" as one reason for the depressed Palestinian economic activity. According to the Palestinian Negotiations Affairs Department (NAD) and other sources, much of Qalqilyah's farmland now lie outside the barrier, and farmers require permits from Israeli authorities to access their lands that are on the opposite side. In the town of Jayyus, in the district of Qalqilya there are three gates in the barrier for the purpose of admitting farmers with permits to their fields that are open three times a day for a total of 50 minutes, although according to the NAD they have often been arbitrarily closed for extended periods leading to loss of crops, and one of these gates has been closed since August 2004 due to a suicide attack that took place near the gate. The Israeli human rights organisation B'Tselem notes that "thousands of Palestinians have difficulty going to their fields and marketing their produce in other areas of the West Bank. Farming is a primary source of income in the Palestinian communities situated along the Barrier's route, an area that constitutes one of the most fertile areas in the West Bank. The harm to the farming sector is liable to have drastic economic effects on the residents – whose economic situation is already very difficult – and drive many families into poverty." On two occasions the Israeli government has been instructed by the Supreme Court of Israel to alter the route of the barrier to ensure that negative impacts on Palestinians would be minimized and proportional. In 2004, the United Nations passed a number of resolutions and the International Court of Justice issued an advisory opinion calling for the barrier to be removed, and for Arab residents to be compensated for any damage done: "The Court finds that the construction by Israel of a wall in the Occupied Palestinian Territory and its associated régime are contrary to international law." The UN General Assembly asked the International Court of Justice to evaluate the legal status of Israel’s “separation wall.” In July 2004, the Court declared the illegality of the barrier. The Security Council has yet to accept and enforce the Court’s ruling, however, and the United Nations remains sidelined in the conflict. Israel submitted a 246 page written statement containing the views of the Government of Israel on Jurisdiction and Propriety to the Court, but chose not make any oral statements. Israeli public opinion has been very strongly in favor of the barrier, partly in the hope that it will improve security and partly in the belief that the barrier marks the eventual border of a Palestinian state. Due to the latter possibility, the settler movement opposes the barrier, although this opposition has waned since it became clear the barrier would be diverted to the east of major Israeli settlements such as Ariel. According to Haaretz, a survey conducted by the Tami Steinmetz Center for Peace Research, Tel Aviv University, there is an overwhelming support for the barrier among the Jewish population of Israel: 84% in March 2004 and 78% in June 2004. Most Israelis believe the barrier and intensive activity by the Israel Defense Forces to be the main factors in the decrease in successful suicide attack from the West Bank. The proponents of the barrier insist that reversible inconveniences to Palestinians should be balanced with the threats to lives of Israeli civilians and believe that the barrier is a non-violent way to stop terrorism and save innocent lives. However, there are some Israelis who oppose the barrier. The Israeli Peace Now movement has stated that while they would support a barrier that follows the 1949 Armistice lines, the "current route of the fence is intended to destroy all chances of a future peace settlement with the Palestinians and to annex as much land as possible from the West Bank" and that the barrier would "only increase the blood to be split on both sides and continue the sacrificing of Israeli and Palestinian lives for the settlements." Additionally, many Israelis living in settlements, such as the Gush Etzion area, oppose the fence because it separates them from the rest of Israel. They argue that building the fence defines a border, and that they are being left out (currently the Gush Etzion area is located on Israel's side of the barrier and they strongly support the fence). According to most settlers, all of the West Bank belongs to Israel, and separating any of it with a fence is the first step in giving the land away. Some Israeli left wing activists, such as Anarchists Against the Wall and Gush Shalom are active in protests against the barrier, especially in the West Bank towns of Bil'in and Jayyous. More broadly, Palestinian spokespersons, supported by many in the Israeli left wing and other organizations, claim that the hardships imposed by the barrier will breed further discontent amongst the affected population and add to the security problem rather than solving it. On April 14, 2004, American President George W. Bush said "In light of new realities on the ground, including already existing major Israeli population centers, it is unrealistic to expect that the outcome of final status negotiations will be a full and complete return to the armistice lines of 1949, and all previous efforts to negotiate a two-state solution have reached the same conclusion.” In direct reaction to Bush's comments, the leadership of the Palestinian National Authority accused the U.S. of rewarding construction of the barrier and replied, "[t]he US assurances are being made at the expense of the Palestinian people and the Arab world without the knowledge of the legitimate Palestinian leadership. They are rewarding illegal occupation, settlement and the apartheid wall." In October 2003, a United Nations resolution to declare the barrier illegal where it deviates from the green line and should be torn down was vetoed by the US in the United Nations Security Council. In December 2003, resolution ES-10/14 was adopted by the United Nations General Assembly in an emergency special session. The resolution included a request to the International Court of Justice "to urgently render an advisory opinion". The court concluded that the barrier violated international law. On 20 July 2004, the UN General Assembly accepted another resolution condemning the barrier with 150 countries voting for the resolution. Only 6 countries voted against: Israel, the US, Australia, Micronesia, the Marshall Islands and Palau. The US and Israel rejected both the verdict and the resolution. All 25 members of the European Union voted in favour of the resolution after it was amended to include calls for Israelis and Palestinians to meet their obligations under the "roadmap" peace plan. Amnesty International, Human Rights Watch and other Human rights groups have protested both the routing of the wall and the means by which the land to build the wall was obtained. In a 2004 report Amnesty International wrote that "The fence/wall, in its present configuration, violates Israel’s obligations under international humanitarian law." Since the summer of 2002 the Israeli army has been destroying large areas of Palestinian agricultural land, as well as other properties, to make way for a fence/wall which it is building in the West Bank. In addition to the large areas of particularly fertile Palestinian farmland that have been destroyed, other larger areas have been cut off from the rest of the West Bank by the fence/wall. The fence/wall is not being built between Israel and the Occupied Territories but mostly (close to 90%) inside the West Bank, turning Palestinian towns and villages into isolated enclaves, cutting off communities and families from each other, separating farmers from their land and Palestinians from their places of work, education and health care facilities and other essential services. This in order to facilitate passage between Israel and more than 50 illegal Israeli settlements located in the West Bank. On July 25, 2003, then-President of the United States George W. Bush said "I think the wall is a problem. And I discussed this with Ariel Sharon. It is very difficult to develop confidence between the Palestinians and Israel with a wall snaking through the West Bank." The following year, addressing the issue of the barrier as a future border, he said in a letter to Sharon on April 14, 2004 that it "should be a security rather than political barrier, should be temporary rather than permanent and therefore not prejudice any final status issues including final borders, and its route should take into account, consistent with security needs, its impact on Palestinians not engaged in terrorist activities." President Bush reiterated this position during a May 26, 2005 joint press conference with Palestinian leader Mahmoud Abbas in the Rose Garden. In 2005, Hillary Rodham Clinton, at the time a U.S. Senator from New York, said she supports the separation fence Israel is building along the edges of the West Bank, and that the onus is on the Palestinian Authority to fight terrorism. "This is not against the Palestinian people," she said during a tour of a section of the barrier being built around Jerusalem. "This is against the terrorists. The Palestinian people have to help to prevent terrorism. They have to change the attitudes about terrorism." Clinton's comments echoed Israel's position that the Palestinians must crack down on militants or Israel will find ways to prevent attacks on its citizens. Israel Defense Forces commanders explained the security considerations of the barrier to Clinton at an observation point in the southern Jerusalem neighborhood of Gilo. The Canadian Government recognizes Israel's right to protect its citizens from terrorist attacks, including through the restriction of access to its territory, and by building a barrier on its own territory for security purposes. However, they oppose the barrier's incursion into and the disruption of occupied territories. Regarding the West Bank (including East Jerusalem) as "occupied territory", Canada's government considers the barrier to be contrary to international law under the Fourth Geneva Convention. They oppose the barrier and the expropriations and the demolition of houses and economic infrastructure preceding its construction. Section of West Bank barrier located on Route 443, near Jerusalem. Painting was done by the official contractor probably. Graffiti on the Palestinian side of walled sections of the barrier has consistently been one of many forms of protest against its existence. Large areas of the walls feature messages relating to the Israeli-Palestinian conflict, demanding an end to the barrier, or criticizing its builders and its existence ('Welcome to the Ghetto-Abu Dis'). In August 2005, the U.K. graffiti artist Banksy painted nine images on the Palestinian side of the barrier. He describes the barrier as "the ultimate activity holiday destination for graffiti writers", and returned in December 2007 with new images for "Santa's ghetto" in Bethlehem. The Times headlined the graffiti project "Let Us Spray". On June 21, 2006, Pink Floyd's Roger Waters wrote "Tear down the wall" on the wall, a phrase from the Pink Floyd album The Wall. Some speculate that because sections of the barrier are not built along the Green Line but in the West Bank, the real purpose is to acquire territory. Some people describe the barrier as the de facto future border of the State of Israel. James Zogby, president of the Arab American Institute, has said that the barrier has "unilaterally helped to demarcate the route for future Israeli control over huge West Bank settlement blocks and large swathes of West Bank land". According to B'Tselem, "the overall features of the separation barrier and the considerations that led to determination of the route give the impression that Israel is relying on security arguments to unilaterally establish facts on the ground ..." Chris McGreal in The Guardian writes that the barrier is, "evidently intended to redraw Israel's borders". Some have speculated that the barrier will prejudice the outcome of border negotiations in favor of the Israelis. Yossi Klein Halevi, Israeli correspondent for The New Republic, writes that "[b]uilding over the green line, by contrast, reminds Palestinians that every time they've rejected compromise—whether in 1937, 1947, or 2000—the potential map of Palestine shrinks... The fence is a warning: If Palestinians don't stop terrorism and forfeit their dream of destroying Israel, Israel may impose its own map on them... and, because Palestine isn't being restored but invented, its borders are negotiable." 13.50: All people (male and female) between the ages of 16 to 30 who are residents of Tulkarem, Nablus and Jenin, and the villages surrounding these towns, are not allowed southward. 14.44: A car with a bridegroom arrives at the checkpoint. His wedding is in Beit Lid. However he is from Tulkarem and young and he is told he can't pass through. A relative of his who is from Taibe and who speaks fluent Hebrew, tries to talk to all the soldiers to convince them to let him pass through. 14.50: The bus with only women and children who are heading to Beit Lid for the wedding arrives at the checking booth. IDs are checked. Five of the young women, some with young children, are from Tulkarem and are told to leave the bus. 14.59: They are not allowed to pass. They get a taxi on the other side of the street to go back home. The bridegroom has still not been allowed through. Aunts, uncles and other relatives are all standing around trying to figure out what to do. The relative from Taibe continues to go from one soldier to the other to ask for help. 15.10: The bridegroom is told he cannot go through. He stands to the side. 15.37: The bridegroom is sent home. Some opponents of the barrier claim that building and maintaining the wall is a crime of apartheid, isolating Palestinian communities in the West Bank and consolidating the annexation of Palestinian land by Israeli settlements. However, this is disputed by others. ^ a b c d "Israel High Court Ruling Docket H.C.J. 7957/04: International Legality of the Security Fence and Sections near Alfei Menashe". Supreme Court of Israel. September 15, 2005. http://www.zionism-israel.com/hdoc/High_Court_Fence.htm. Retrieved 2007-04-16. ^ a b c d "Separation Barrier: Statistics". B'Tselem. January 2007. http://www.btselem.org/english/Separation_Barrier/Statistics.asp. Retrieved 2007-04-17. ^ Lazaroff, Tova (July 10, 2007). "Fence to be completed only by 2010". The Jerusalem Post. http://www.jpost.com/servlet/Satellite?cid=1183980036196&pagename=JPost%2FJPArticle%2FShowFull. Retrieved 2007-07-10. ^ "Questions and Answers". Israel’s Security Fence. The State of Israel. February 22, 2004. http://www.securityfence.mod.gov.il/Pages/ENG/questions.htm. Retrieved 2007-04-17. "The Security Fence is being built with the sole purpose of saving the lives of the Israeli citizens who continue to be targeted by the terrorist campaign that began in 2000. The fact that over 800 men, women and children have been killed in horrific suicide bombings and other terror attacks clearly justifies the attempt to place a physical barrier in the path of terrorists. It should be noted that terrorism has been defined throughout the international community as a crime against humanity. As such, the State of Israel not only has the right but also the obligation to do everything in its power to lessen the impact and scope of terrorism on the citizens of Israel." ^ a b Nissenbaum, Dion (January 10, 2007). "Death toll of Israeli civilians killed by Palestinians hit a low in 2006". Washington Bureau. McClatchy Newspapers. http://www.mcclatchydc.com/staff/dion_nissenbaum/story/15469.html. Retrieved 2007-04-16. "Fewer Israeli civilians died in Palestinian attacks in 2006 than in any year since the Palestinian uprising began in 2000. Palestinian militants killed 23 Israelis and foreign visitors in 2006, down from a high of 289 in 2002 during the height of the uprising. Most significant, successful suicide bombings in Israel nearly came to a halt. Last year, only two Palestinian suicide bombers managed to sneak into Israel for attacks that killed 11 people and wounded 30 others. Israel has gone nearly nine months without a suicide bombing inside its borders, the longest period without such an attack since 2000[...] An Israeli military spokeswoman said one major factor in that success had been Israel's controversial separation barrier, a still-growing 250-mile (400 km) network of concrete walls, high-tech fencing and other obstacles that cuts through parts of the West Bank. ‘The security fence was put up to stop terror, and that's what it's doing,’ said Capt. Noa Meir, a spokeswoman for the Israel Defense Forces. [...] Opponents of the wall grudgingly acknowledge that it's been effective in stopping bombers, though they complain that its route should have followed the border between Israel and the Palestinian territories known as the Green Line. [...] IDF spokeswoman Meir said Israeli military operations that disrupted militants planning attacks from the West Bank also deserved credit for the drop in Israeli fatalities." ^ a b "Under the Guise of Security: Routing the Separation Barrier to Enable Israeli Settlement Expansion in the West Bank". Publications. B'Tselem. December 2005. http://www.btselem.org/english/Publications/summaries/200512_Under_the_Guise_of_Security.asp. Retrieved 2007-04-16. "The fact that the Separation Barrier cuts into the West Bank was and remains the main cause of human rights violations of Palestinians living near the Barrier. Israel contends that the Barrier's route is based solely on security considerations. 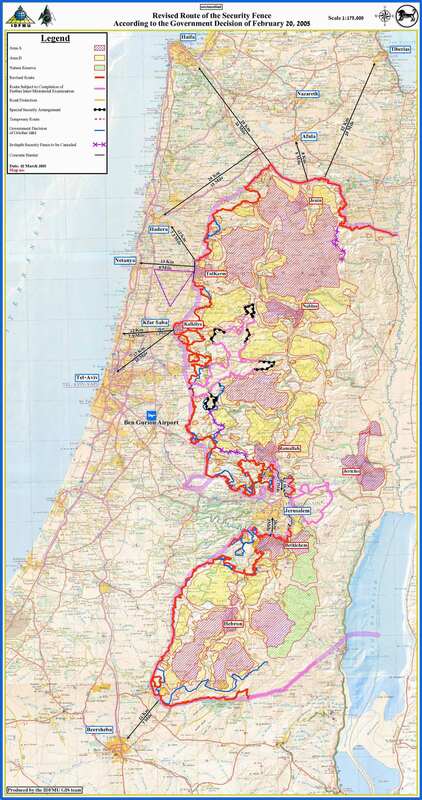 This report disputes that contention and proves that one of the primary reasons for choosing the route of many sections of the Barrier was to place certain areas intended for settlement expansion on the "Israeli" side of the Barrier. In some of the cases, for all intents and purposes the expansion constituted the establishment of a new settlement." ^ "U.N. court rules West Bank barrier illegal". CNN. July 9, 2004. http://www.cnn.com/2004/WORLD/meast/07/09/israel.barrier/index.html. Retrieved 2007-04-16. "The International Court of Justice has said the barrier Israel is building to seal off the West Bank violates international law because it infringes on the rights of Palestinians. In an advisory opinion issued Friday in The Hague, the U.N. court urged the Israelis to remove it from occupied land. The nonbinding opinion also found that Israel was obligated to return confiscated land or make reparations for any destruction or damage to homes, businesses and farms caused by the barrier's construction." ^ a b Bedell, Geraldine (June 15, 2003). "Set in stone". The Guardian. http://www.guardian.co.uk/israel/Story/0,2763,976105,00.html. Retrieved 2007-04-16. "The Palestinian Authority, meanwhile, preoccupied with the road map and its own internal politics, ‘has neglected the wall,’ according to Jamal Juma. Yet the wall is crucial to the road map. At the very least, it is an attempt to preempt negotiations with a land grab that establishes new borders (and what the road map calls ‘facts on the ground’ that must be heeded). Arguably it is more devious: an attempt to undermine negotiations altogether - because what Palestinian Authority could sign up to the fragmented 'state' the wall will create?" ^ a b "Legal Consequences of the Construction of a Wall in the Occupied Palestinian Territory: Advisory Opinion". Cases. International Court of Justice. July 9, 2004. Archived from the original on 2004-07-04. http://www.icj-cij.org/docket/index.php?pr=71&p1=3&p2=1&case=131&p3=6. Retrieved 2007-04-16. ^ a b "Building the Ghetto Wall of Auschwitz". Media Releases - June 2002. Women In Green. June 21, 2002. http://www.womeningreen.org/sayjune02.htm. Retrieved 2007-04-16. "The Land of Israel belongs to the Jewish People as the Bible and the God of Israel has indicated. If the Arabs wish to live in a Jewish State under Israel sovereignty, they must do so in a peaceful and tolerant manner. [...]The solution to terror is thus not erecting a fence but completely destroying the Palestinazi Authority; expelling all supporters of terror and reinstalling Jewish-Israeli control and sovereignty over all of Judea, Samaria and Gaza." ^ (Mohammed Abed/AFP/Getty) (January 24, 2008). "Hamas 'spent months cutting through Gaza wall in secret operation'". London: pub. http://www.timesonline.co.uk/tol/news/world/middle_east/article3238615.ece. Retrieved 2008-03-15. ^ "Israel and the Palestinians: Key terms". BBC News. 12 October 2006. http://news.bbc.co.uk/newswatch/ukfs/hi/newsid_6040000/newsid_6044000/6044090.stm#barrier. Retrieved 2008-03-15. "BBC journalists should try to avoid using terminology favoured by one side or another in any dispute. The BBC uses the terms "barrier", "separation barrier" or "West Bank barrier" as acceptable generic descriptions to avoid the political connotations of "security fence" (preferred by the Israeli government) or "apartheid wall" (preferred by Palestinians)." ^ a b Nunez, Sandy. "Warring Communities Separated By Wall". ABCNEWS. http://abcnews.go.com/WNT/Story?id=130307&page=1. ^ a b c d Makovsky, David (March/April 2004). "How to Build a Fence". Foreign Affairs 83 (2): 50–64. ISSN 0015-7120. http://scholar.google.com/scholar?hl=en&lr=&safe=off&q=cache:bmn8VgiU6WoJ:www.amherst.edu/~daschaich/writings/rant/fence.pdf+. Retrieved 2007-04-16. ^ Ratner, David (February 12, 2002). "Gilboa towns build DIY separation fence". Haaretz. http://www.7th-day.co.il/hayom-hashvie/fence.htm. Retrieved 2007-04-16. "Residents in the Gilboa region waited two years for a separation fence to be built. Now, after having sent repeated entreaties to the government and having received assorted, unfulfilled promises, they have decided to ‘take the law into their own hands,’ and build the fence themselves." ^ "Palestinians: Israel hands out land confiscation notices". CNN. November 7, 2003. http://edition.cnn.com/2003/WORLD/meast/11/05/mideast. Retrieved 2007-04-16. "The West Bank barrier generally runs close to the pre-1967 Mideast war border -- the so-called Green Line -- but dips into the West Bank to include some Jewish settlements. Israel says a new section will extend deep into the West Bank, surrounding several West Bank towns." ^ "OPERATIONAL CONCEPT". The State of Israel. 2007-01-31. http://www.securityfence.mod.gov.il/Pages/ENG/operational.htm. Retrieved 2008-03-15. "Solid barrier system ... main purpose is to prevent sniper fire into Israel and on major highways and roads. In this case, a solid concrete wall resembling a highway sound barrier often used in the US and Europe is erected. Once the whole project is completed, the portion of the concrete sections will be 6%, approximately 30 km." ^ Researched and written by Yehezkel Lein (April 2003). "Behind The Barrier : Human Rights Violations As a Result of Israel's Separation Barrier" (PDF). B'Tselem. http://www.nad-plo.org/palisraeli/wall/related/bwall.pdf. Retrieved 2008-03-15. "The average width of the barrier complex is sixty meters. Due to topographic constraints, a narrower barrier will be erected in some areas and will not include all of the elements that support the electronic fence. However, as the state indicated to the High Court of Justice, “in certain cases, the barrier will reach a width of one hundred meters due to the topographic conditions.”"
^ "Is the fence effective?". Israel’s Security Fence: Questions and Answers. The State of Israel. February 22, 2004. http://www.securityfence.mod.gov.il/Pages/ENG/questions.htm#q26. Retrieved 2007-04-20. "Members of Palestinian terror infrastructure caught and questioned disclosed the reality that the existence of the security fence in the Samaria area forces them to find other means to perform terror attacks because their previous entry to Israel is blocked." ^ Amos Hrel (2006). "Shin Bet: Palestinian truce main cause for reduced terror". Haaretz. http://www.haaretz.com/hasen/objects/pages/PrintArticleEn.jhtml?itemNo=664916. Retrieved 2007-08-11. ^ a b Moshe Arens: The fence, revisited Haaretz October 28, 2008. ^ "The Humanitarian Impact of the West Bank Barrier on Palestinian Communities" (PDF). United Nations. March, 2005 Update 5. http://www.humanitarianinfo.org/opt/docs/UN/OCHA/OCHABarRprt05_Full.pdf. Retrieved 2008-03-15. ^ a b c "Q&A: What is the West Bank barrier?". BBC News. 15 September 2005. http://news.bbc.co.uk/2/hi/middle_east/3111159.stm. Retrieved 2008-03-15. "The solid section around the Palestinian town of Qalqilya is conceived as a "sniper wall" to prevent gun attacks against Israeli motorists on the nearby Trans-Israel Highway." ^ [http "Palestinians: Israel hands out land confiscation notices"]. CNN News. November 7, 2003 Posted: 0332 GMT (11:32 AM HKT). http. Retrieved 2008-03-15. ^ "OCHA oPt Barrier Report July 2009". http://www.ochaopt.org/documents/ocha_opt_barrier_report_july_2009_english_low_res.pdf. Retrieved 2009-11-22. ^ HEPG (March 2004). "The Impact of Israel’s Separation Barrier on Affected West Bank Communities" (PDF). Humanitarian Emergency Policy Group (HEPG). http://www.humanitarianinfo.org/opt/docs/UN/OCHA/Barrierupdate7mar04.pdf. Retrieved 2008-03-15. "In preparation of the new route of the Barrier in Nazlat Isa, the IDF demolished more than 120 shops during August 2003. A second demolition of 82 shops was completed by the IDF in January 2003. Storeowners were given as little as 30 minutes to evacuate their premises before the demolitions started. Apart from Tulkarm town, Nazlat Isa was the main commercial centre for the Tulkarm area and was heavily dependent on commerce with Israel." ^ JAMES BENNET (2003-01-22). "Israel Destroys Arabs´ Shops in West Bank (NY TIMES)JERUSALEM, ISRAEL)". NYTimes. http://query.nytimes.com/gst/fullpage.html?res=9E06E1DF1030F931A15752C0A9659C8B63. Retrieved 2008-03-15. "Jan. 21 — The Israeli Army used bulldozers to flatten dozens of shops today in one of the only thriving Palestinian commercial centers near the West Bank boundary, saying that the store owners lacked permits." ^ http://unpan1.un.org/intradoc/groups/public/documents/unescwa/unpan035390.pdf ECONOMIC AND SOCIAL REPERCUSSIONS OF THE ISRAELI OCCUPATION. FACTS AND FIGURES. October 2008. Retrieved on 8 August 2009. ^ "Barrier 'harms West Bank health'". BBC News. 15 February 2005. http://news.bbc.co.uk/2/hi/middle_east/4268079.stm. Retrieved 2008-03-17. ^ Deborah Cohen (2005;330:381 (19 February)). "Barrier in West Bank threatens residents' health care, says report". BMJ Publishing Group Ltd.. http://www.bmj.com/cgi/content/full/330/7488/381. Retrieved 2008-03-17. "In Abu Dis and Aizaria, two Palestinian towns where the barrier has already been completed, the average time for an ambulance to travel to the nearest hospitals in Jerusalem has increased from about 10 minutes to over one hour and 50 minutes, according to the report. Mr Garrigue says that once the barrier is completed this problem will affect many more villages." ^ Ibrahim Habib (October 20, 2005). "A Wall in the Heart - The Separation Barrier and its Impact on the Right to Health and on Palestinian Hospitals in East Jerusalem" (Word DOC). Physicians for Human Rights-Israel. http://www.phr.org.il/phr/files/articlefile_1134502825051.doc. Retrieved 2008-03-17. ^ MIFTAH (January 31, 2003). "The so-called ‘Security Wall’". pub. http://www.miftah.org/display.cfm?DocId=1754&CategoryId=4. Retrieved 2008-03-17. ^ "Israel's Wall" (PDF). Negotiations Affairs Department (NAD)- PLO. July 9, 2005. http://www.nad-plo.org/facts/wall/WallMagazine%207-2005.pdf. Retrieved 2008-03-17. ^ "We are no longer able to see the sun set". pub. 7–13 July 2005. http://weekly.ahram.org.eg/2005/750/focus.htm. Retrieved 2008-03-17. "In the town of Jayyus, in the Qalqilya Governorate, the Israeli military opens the check-point briefly. An Israeli military sign in Arabic announces the check-point is open from 7:40 to 8:00, 14:00 to 14:15, and 18:45-19:00, only 50 minutes a day." ^ a b B'Tselem (2007). "Separation Barrier". B'Tselem. http://www.btselem.org/English/Separation_Barrier/index.asp. Retrieved 2008-03-17. "The harm to the farming sector is liable to have drastic economic effects on the residents - whose economic situation is already very difficult - and drive many families into poverty." ^ "Israel barrier 'hurting farmers'". BBC News. 21 March 2006. http://news.bbc.co.uk/2/hi/middle_east/4830654.stm. Retrieved 2008-03-17. "A UN report into the humanitarian impact of Israel's West Bank barrier says it has caused widespread losses to Palestinian farmers." ^ "U.S. vetoes U.N. resolution on Israeli wall". St. Petersburg Times. October 15, 2003. http://www.sptimes.com/2003/10/15/Worldandnation/US_vetoes_UN_resoluti.shtml. Retrieved 2007-05-21. ^ "ES-10/14. Illegal Israeli actions in Occupied East Jerusalem and the rest of the Occupied Palestinian Territory". United Nations. 2003-12-12. http://domino.un.org/unispal.nsf/5ba47a5c6cef541b802563e000493b8c/f953b744269b9b7485256e1500776dca!OpenDocument. Retrieved 2009-04-17. ^ International Court of Justice (December 19, 2003). "Legal Consequences of the Construction of a Wall in the Occupied Palestinian Territory". UNISPAL. http://domino.un.org/unispal.nsf/2ee9468747556b2d85256cf60060d2a6/7112c39bf71fe0c485256e010075307d!OpenDocument. Retrieved 2007-05-21. ^ a b "UN Assembly votes overwhelmingly to demand Israel comply with ICJ ruling". United Nations News Centre. July 20, 2004. http://www.un.org/apps/news/story.asp?NewsID=11418&Cr=middle&Cr1=east. Retrieved 2007-05-21. ^ "UN demands Israel scrap barrier". BBC. July 21, 2004. http://news.bbc.co.uk/1/hi/world/middle_east/3911785.stm. Retrieved 2007-05-21. ^ "Red Cross slams Israel barrier". BBC News. 18 February 2004. http://news.bbc.co.uk/2/hi/middle_east/3498795.stm. Retrieved 2008-03-17. ^ George Bush (12:05 P.M. EDT July 25, 2003). "President Bush Welcomes Prime Minister Abbas to White House Remarks by President Bush and Prime Minister Abbas". US White House. http://georgewbush-whitehouse.archives.gov/news/releases/2003/07/20030725-6.html. Retrieved 2008-03-15. ^ George Bush (11:31 A.M. EDT May 26, 2005). "President Welcomes Palestinian President Abbas to the White House". US White House. http://georgewbush-whitehouse.archives.gov/news/releases/2005/05/20050526.html. Retrieved 2008-03-15. ^ Lily Galili and Roni Singer (2005-11-13). "Sen. Clinton: I support W. Bank fence, PA must fight terrorism". Haaretz. http://www.haaretz.com/hasen/pages/ShArt.jhtml?itemNo=644798. ^ Department of Foreign Affairs and International Trade: "Canadian policy on key issues in the Israeli-Palestinian Conflict". Department of Foreign Affairs and International Trade - Canadian Government. 2007-07-04. http://www.dfait-maeci.gc.ca/middle_east/can_policy-en.asp#08. Retrieved 2008-03-17. ^ "In pictures: Banksy returns to Bethlehem". BBC News. 3 December 2007. http://news.bbc.co.uk/2/hi/in_pictures/7125611.stm. Retrieved 2008-03-15. ^ "Waters writes on West Bank wall". BBC News. 22 June 2006. http://news.bbc.co.uk/2/hi/entertainment/5104930.stm. Retrieved 2008-03-15. ^ Lobe, Jim (2003-12-20). "US Peace Activists Denounce Sharon's Speech". Inter Press Service. http://www.commondreams.org/headlines03/1220-09.htm. Retrieved 2008-03-18. ^ a b McGreal, Chris (October 18, 2005). "Israel redraws the roadmap, building quietly and quickly". The Guardian. http://www.guardian.co.uk/frontpage/story/0,16518,1594808,00.html. Retrieved 2007-04-16. ^ "Realities on the Ground". miftah. July 22, 2005. http://www.miftah.org/Display.cfm?DocId=8002&CategoryId=3. Retrieved 2008-03-17. ^ Yossi Klein Halevi (2003-10-30). "Fenced In". The New Republic. http://www.travelbrochuregraphics.com/extra/fenced_in.htm. Retrieved 2008-03-17. ^ GREG MYRE (March 9, 2006). "Olmert Wants to Set Israeli-Palestinian Border by 2010". New York Times. http://www.nytimes.com/2006/03/09/international/middleeast/09cnd-mideast.html?ex=1299560400&en=f7a513d8dac15769&ei=5088&partner. Retrieved 2008-03-17. "Ehud Olmert, said that if his Kadima Party wins national elections this month, he would seek to set Israel's permanent borders by 2010, and that the boundary would run along or close to Israel's separation barrier in the West Bank." ^ http://www.amnestyusa.org/document.php?id=ENGMDE150332007&rss=justice Amnesty International USA. Enduring occupation Palestinians under siege in the West Bank. 2007. Retrieved on 8 August 2009. ^ AHMAD HAJIHOSSEINI (2003-10-14). "Press Release SC/7895 Security Council 4841st Meeting (AM)". United Nations. http://www.un.org/News/Press/docs/2003/sc7895.doc.htm. Retrieved 2008-03-17. "AHMAD HAJIHOSSEINI, Observer for the Organization of the Islamic Conference (OIC), said the form of apartheid Israel practised against Palestinians fulfilled all elements of the crime as defined under the 1976 apartheid Convention." ^ Rufin, Jean-Christophe. "Chantier sur la lutte contre le racisme et l'antisémitisme", presented on October 19, 2004. Cited in Matas, David. Aftershock: Anti-Zionism and anti-Semitism. Dundurn, 2005, p. 54 and p. 243, footnotes 59 and 60. ^ Matas, David. Aftershock: Anti-Zionism and anti-Semitism. Dundurn, 2005, pp. 53-55. Barrier Gates: Northern West Bank (map)PDF (1.21 MB). Commission on Human Rights: Report on 61st sessionPDF (2.25 MB). Reply to the ICJ Advisory OpinionPDF (2.29 MB), detailed 193 page book supporting a position in favor of the barrier. The Israel-West-Bank barrier is a wall being built by the State of Israel to separate Palestinian territories from Israel. It is built mostly of fences and in some places it is built of high concrete walls. Gush Shalom site about the Separation Wall - Israel's "Separation Wall"
''Not an "Apartheid Wall"'' - Not an "Apartheid Wall"
''Q&A: What is the West Bank barrier?'' - BBC NEWS | Middle East | Q&A: What is the West Bank barrier? UN OCHA Humanitarian Information Centre in the occupied Palestinian territory - HIC oPt website is being archived. HonestReporting.com - HonestReporting: monitoring mideast media anti-Israel bias. BW Online | July 18, 2002 | Israel's Wall: A Step Toward Peace?